What feels like the millionth Chris Brown song of the past two months hits #1. Somehow, 2017 had more Chris Brown music in store for us. 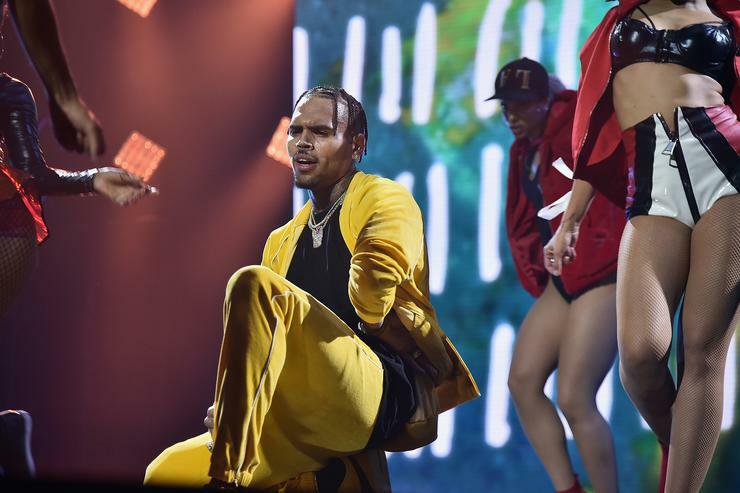 After months of delays (but also loosies and leaks), Breezy shared his massive double album Heartbreak on a Full Moon in October, which contained more songs than most artists release in two years. The following weeks brought outtakes, many of which ended up in our top ten. Thought he was done? Nah. Last week, he shared a deluxe edition of the album as well as a remix of single "Sensei." Is he done for the year yet? Don't count him out til 11:59 on December 31st. Breezy notches two appearances this week on our TOP 100, which ties Kendrick Lamar for the most of the week. New tracks barely missing out on spots this week include Jay Jones and Lil Wayne's "Go Crazy" (#11), Zaytoven, Migos, and Young Thug's "Five Guys" (#12), Tay-K, 21 Savage, and Young Nudy's remix of "The Race" (#13), and Chris Brown and Trippie Redd's "Yoppa" (#14). YoungBoy's another guy who's had quite the productive year, and this past week he came through with a re-titled remix of his and Moneybagg Yo's "Prime Suspect" from their recent collaborative tape. Replacing Yo with Kodak Black, "Chosen One" debuts at #10. The first of Breezy's entries this week is a catchy pop banger produced by d.a. doman entitled "Goin At It." Included on the Heartbreak on a Full Moon deluxe edition, this one debuts at #9. Two Fridays ago, Atlanta-based label Quality Control dropped off a 30-song compilation entitled Control The Streets Volume 1, and one definite highlight is "Mediterranean," a collab between Offset and Travis Scott. Even though Quavo's the Migo with a joint project with Travis in the works, these two also have definite chemistry. In its second week out, this one is up seven places from #15 to #8. Eminem's rocky new album Revival arrived this past week, and preceding it was this poorly-received single, "Untouchable." In its second week out, it's down five places from #2 to #7. Tory Lanez has steadily been dropping singles in preparation for his upcoming sophomore album Memories Don't Die, and like all of its predecessors, the latest one debuts in our top ten. "Like Dope" features Cali duo Audio Push and Anthony Danza, and it lands at #6 on its first week out. G-Eazy's also got up for a new album out (as well as a tour), and makes a return to a previous single with this big remix. "No Limit" originally featured A$AP Rocky and Cardi B, but for round two he's removed the latter in favor of French Montana, Juicy J, and Belly. It debuts at #5. 4. N.E.R.D. Feat. Kendrick Lamar & Frank Ocean - Don't Don't Do It! N.E.R.D. 's comeback album No_One Ever Really Dies arrived a couple of days ago, and with it came many star-studded collabs, including this one featuring Kendrick Lamar and Frank Ocean, marking the first time they've worked together (unless you believe the rumor that K Dot contributed ad-libs to Blonde's "Skyline To"). "Don't Don't Do It" debuts at #4. The soundtrack for Will Smith's new movie Bright has already brought plenty of unlikely collaborations, chief of which is a song pairing DRAM and Neil Young (?! ), and here's another one. "That's My N**** sets Dr. Dre's "Still D.R.E." melody to a trap beat, and in doing so, debuts at #3. K Dot and J. Cole may never actually make their long-rumored collab album, but last week, Jeezy gave us the next best thing in the form of his new single "American Dream." This high-octane collab debuts at #2. Hustle Gang DJ MLK dropped this one off in anticipation of his upcoming mixtape, and the T.I.-assisted "Sensei" remix subsequently caught fire. Also featuring Whoo Kid, this one debuts at #1.